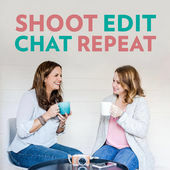 A lively podcast for people photographers & creative entrepreneurs. Two leading UK photographers, Vicki Knights & Eddie Judd, chat about what it's like to run a photography business today. Including interviews with inspiring guests, you'll be entertained, informed and also pick up some business tips along the way. Podcasts written, produced and edited by Eddie & Vicki.